Virgil Gray is doing what he loves to do. 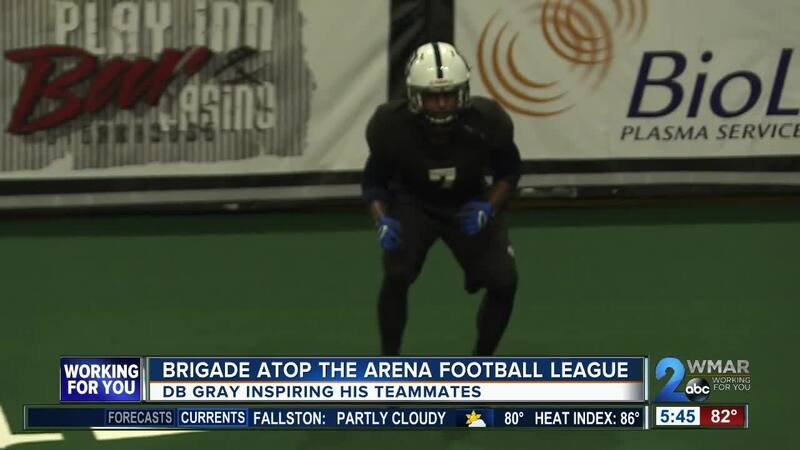 "Playing is just a passion of mine, playing football," said the Brigade defensive back. The road that led Gray to Baltimore wasn't easy. "In 2015 I played for the San Jose SaberCats," said Gray. "I tore my ACL, LCL and hamstring all in one play. I said if I ever tore my ACL I was just going to stop playing." He did for three years. After recovering from the surgeries he joined the Brigade staff last year as defensive backs coach. He put the uniform on this season. "The year coaching under his belt has helped him a lot," said Brigade Head Coach Omarr Smith. "He's playing with a lot more confidence." "My injury, I lost a little bit of explosiveness. But if you ask anybody else, everybody is like I'm playing good," added Gray. Gray's 55 tackles leads the Arena Football League. He's a big reason why the Brigade sits in first place in the AFL with a 6-2 record. "The group that we brought together this year, it's a real close locker room and we're continuing to grow together. That's a big part of our success," said Brigade quarterback Randy Hippeard. The Brigade is an undefeated 4-0 this season at their home venue of Royal Farms Arena. Their next contest brings their rival from down the road, the Washington Valor, Friday night at 7:00 p.m. The Brigade and Valor are both owned by Ted Leonsis and Monumental Sports and Entertainment. That's the same ownership group that owns the Washington Capitals. Coach Smith says the Caps' recent Stanley Cup Championship has resonated with his team. "We relish and enjoy the fact that someone that's like a brother to us as a franchise has won the whole thing," said Smith. "Being able to see their success and the ups and downs that they went through during this playoff series, that's definitely something we can draw on as we go down the stretch here for our season."